COTTAG3: vintage + industrial = really cool! Pretty cool, huh? Jennie likes red too. Don't ya love that big clock on the wall too? She got it from the The Red Shed. Look closely on top of the lockers, on top of the little blue filing thing...do you see that letter holder thingamajig? It's an old block of wood with old rusted castors/wheels attached to it to create a file holder. Isn't that cool? Nope, we didn't think that up (wish we did). Got it at the Red Shed too. Here are some of her cute things in her office. 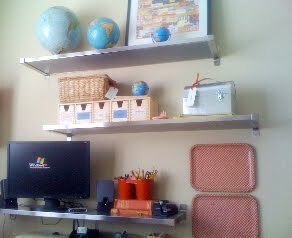 She found these two vintage red check trays and hung them on the wall above the desk. She will be using them as magnetic boards to hold memos and stuff, once she finds some cute magnets. So, there's a peek into Jennie's house. She loves modern farmhouse, coastal, cottage, vintage and industrial. Hopefully, you'll get to see more in the future and hopefully she'll start using a camera instead of that dang iPhone that's permanently attached to her. Then, I'll be able to use those fancy editing things better in Picasa. Don't you want to see more? Hey Jennie, I may be linking this up to some blog parties this week like the ones listed below on the right or up top in my page of favorite blog party links! gimme, gimme, gimme,I want more! Those are great little lockers. It must have been tough getting all that rust before painting them. I love the hits of red around the room. I"m looking forward to seeing more of your friend's house - you've piqued my interest with that fantastic study. you and jennie are both A.M.A.Z.I.N.G! the fact that you've only had a blog since Jan. and have over 100 followers shows that you have design talent girl. you know i love your work! 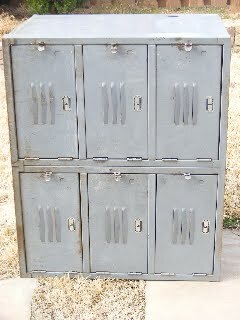 your lockers turned out spectacular and i love, love, love the vintage caster bill organizer! great office too. my question is WHY don't you have a blog??? you REALLY should, you definitely have style. Those are great lockers. Way less expensive than Pottery Barn, right? That is some really good stuff!! Love the trays and the lunch box...how about using some vintage buttons or game pieces hot glued to magnets for the magnetic board/trays?..or whatever other little vintage doodad catches your eye. And it's time to start your blog, Jennie. I just did!! You are right! The lockers were way less than PB. I can't remember exactly how much she paid was I want to say around $40...plus the cost of spray paint. great idea about the magnets. Jennie will read these comments so she'll see that. As for her starting a blog, I've been trying! Yes I do want to see more! Great job, Jennie! So totally awesome. 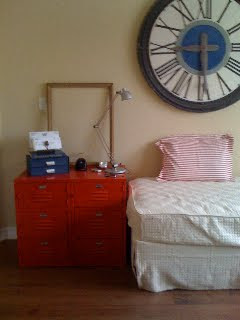 Lovin that clock AND the locker night stand. Awesome! These lockers are great...love them in red! Good heavens...Is *everyone* better at this than me? I feel so un-Martha-worthy now. LOVE her style. And it is STYLE! Thank you so much for joining in the Tales from Bloggeritaville Thrifty Thursday! I appreciate you joining in the party! You two are very very clever!! Love the lockers! That's some very cool junk! The caster letter holder is so clever. Wow! Jennie has great style. Her home office looks like it could be something out of a magazine! 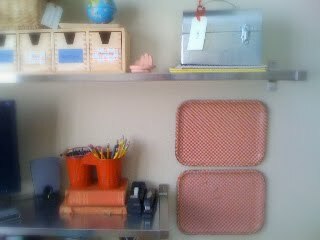 I love the idea of turning the trays into magnetic boards! Very cool. Thanks for sharing. I look forward to seeing more! I love the office! I have been collecting items for a while, that would fit right in with her decor! I just stumbled across this site tonight, and bookmarked it straight away! You guys are good at what you do and I already excited to get new inspiration from you guys! 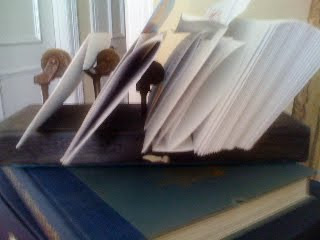 The letter holder is FAN-TAS-TIC! Definitely some very cool and creative projects! I'm hosting a book giveaway. Stop on by! This is so fabulous! Thanks for linking up at Home and Family Friday! Hope to see you next week too! That's a great little craft room. I love how the locker turned out in that bright color. Very cute accessories too. That's a great file cabnet, love it's new color and it's use as a bed side table. I would sure love to see the letter holder step it up with a coat of red paint as well. The large clock is wonderful and I like your industrial shelves. Yay Jennie! 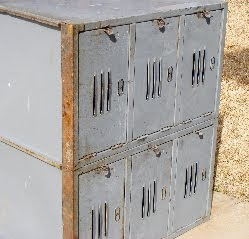 I love the lockers! Your home office looks so sweet! great job! How fun for you that the two of you girls are friends and can go junking together! I wish Gail lived near me....sigh. I'm looking forward to seeing more of your style. Loving your industrial style office! Very cool junk! I love little lockers. I can't believe it! I have a very similar piece (what looks to be a small card catalog drawer thingy) that I intend to turn into a night stand for my son's room!! It looks terrific.